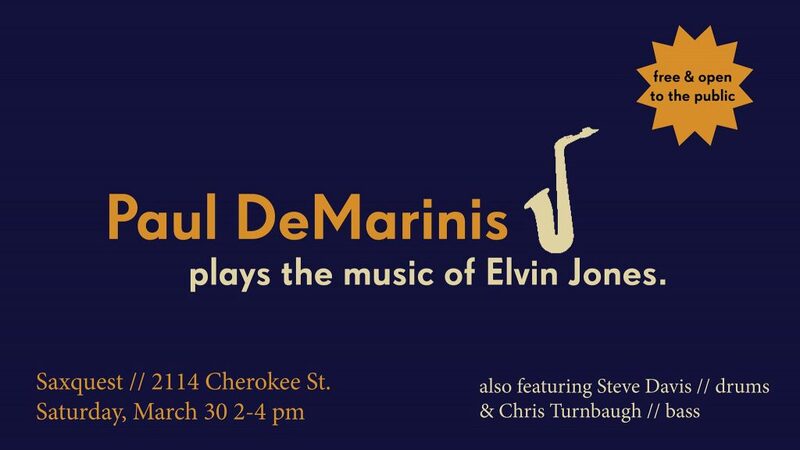 Join us this Saturday, March 30 from 2-4 pm as Paul DeMarinis plays the music of Elvin Jones, the famous drummer from the John Coltrane quartet. This event will also feature Steve Davis on drums and Chris Turnbaugh on bass. Paul DeMarinis is a native of St. Louis. His early musical training included private study as a clarinetist with St. Louis Symphony members Carlos Camancho, Robert Coleman, and Leland Munger. He then attended Indiana University and studied jazz improvisation extensively with the well known jazz education pioneer David Baker while playing lead alto saxophone in the IU big band. During this time he also studied improvisation with famed saxophonist/educator Jamey Aebersold. He received his Bachelors and Masters degrees in Jazz Studies from Webster University in 1982 and 1987. He began teaching as an adjunct faculty member at Webster in 1980. By 1988 he was the full-time Director of the Jazz Studies Program, a position he still holds. At Webster he teaches saxophone, jazz improvisation and jazz history, oversees the ensemble and academic jazz program, coordinates the faculty jazz ensemble, and directs the Webster Jazz Series and the Webster Summer Jazz Camp. He is a well known performer, educator, and clinician and has been active in the St. Louis jazz scene for thirty-five years. He was cofounder of the original music cooperative Brilliant Corners which recorded for the MAX JAZZ label in 1997, and has written extensively for his own trio, quartet, and sextet. A CD of his original jazz compositions, The Sun…The Stars featuring his sextet and vocalist Debby Lennon was released in 2009. He enjoys long term musical relationships with the Kim Portnoy Jazz Orchestra and the St. Louis Jazz Orchestra and was a faculty member of Jamey Aebersold’s Summer Jazz Workshops for ten years. He has also been a faculty member of the International Summer Jazz Academy in Poland. Prof. DeMarinis has a long association as a saxophonist with the St. Louis Symphony; in addition to many performances at Powell Hall he has performed with the SLSO overseas and at New York’s Carnegie Hall. He has performed with many jazz notables including Count Basie Orchestra, Dave Liebman, Louie Bellson, Gary Foster, and Bobby Shew. In a supportive role he has been a member of ensembles accompanying a wide range of popular artists including Tony Bennett, Aretha Franklin, Ray Charles, Nancy Wilson, Doc Severinson, Johnny Mathis, Sammy Davis Jr., Gladys Knight, the Temptations, and the Four Tops. This entry was posted in Featured News, News, Upcoming Events. Bookmark the permalink.